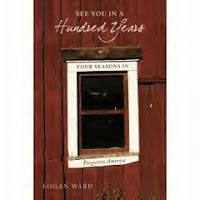 > Friday evening (June 1) was the launch party (and official publication date) for Logan Ward‘s See You in a Hundred Years, the book about his family’s adventure of living a 1900 life style for a year. I reviewed the book here. The festivities began at the Visulite, where Logan gave a powerpoint presentation on the stress of life in 2000 that drove the family back in time for their project. He then read from the book (including a section I’d heard him read before, wisely–those paragraphs about the snakes are sure to give listeners a visceral reaction–and answered questions. Q&A can be awkward when no one speaks up, but the questions were all really good, including one from a little boy who asked if Luther, Logan and Heather’s son, enjoyed the experience. Luther then allowed as how he did, but Logan went into more detail about Luther’s time on the farm. Afterwards people bought copies of the book and Logan signed them at the BookStack and then some of us went back to the Ward home for a further celebration. Great fun. Update: Somebody sent me a link to this article about Logan in today’s Richmond Times Dispatch.